VIBRANT COLOURS - Use this body paint under black light or ultraviolet (UV) light and be amazed by the intense neon glow. HE PERFECT PARTY ACCESSORY - This neon body paint is the perfect accessory to spice up your next party, festival, photoshoot, or night-out. - CHOOSE FROM A WIDE VARIETY - Each pack contains a rainbow selection of colors: yellow, green, orange, pink, blue, red, white, and violet. Content per pot: 8 x 0,7 fl oz (20 ml). 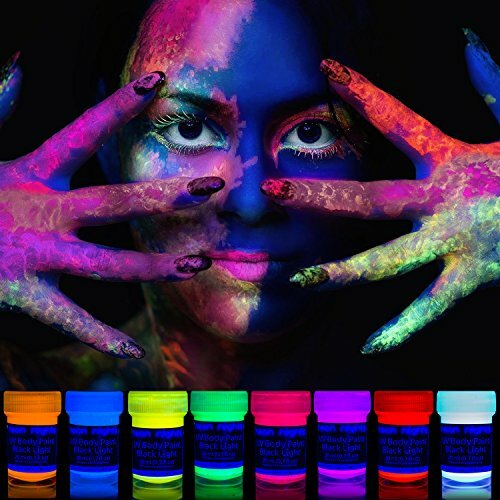 - VIBRANT COLOURS - Use this body paint under black light or ultraviolet (UV) light and be amazed by the intense neon glow. Become the life of the party, stand out from the crowd. - MADE WITH LOVE IN GERMANY - This hand crafted neon bodypaint is of premium quality and the product of choice for over 1,000,000 satisfied customers across various demographics. - EASILY REMOVABLE - No need to worry about clothes or furniture. This paint can even easily be removed from fabrics with only soap and water, perfect for the next day clean up. - THE PERFECT PARTY ACCESSORY - This neon body paint is the perfect accessory to spice up your next party, festival, photoshoot, or night-out. For both amateurs and professionals.